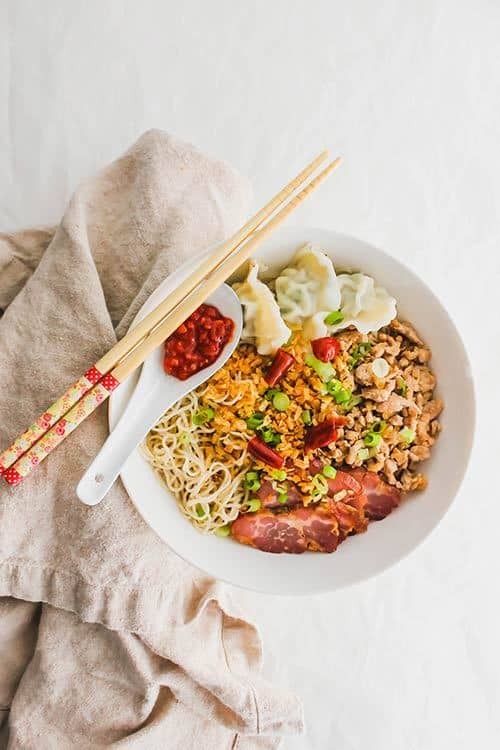 Kolo Mee is a Sarawak Malaysian dish of dry noodles tossed in a savoury pork and shallot mixture, topped off with fragrant fried onions. 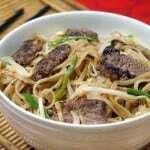 This is a leaner version without the use of lard, which is typically used in hawker stalls. A classic staple food in Malaysia, it is eaten for breakfast, lunch, or dinner. Lunches at home during the summertime holds a special place in my heart. It was a happy and carefree time, being on school holidays, enjoying the warm weather, and always looking forward to the mid-meal of the day. The wafting air of freshly fried onion flakes signaled that my tummy would be in for a delicious treat. 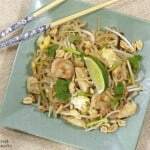 It would also signal that my mother was making one of my favourite noodle dishes: kolo mee. 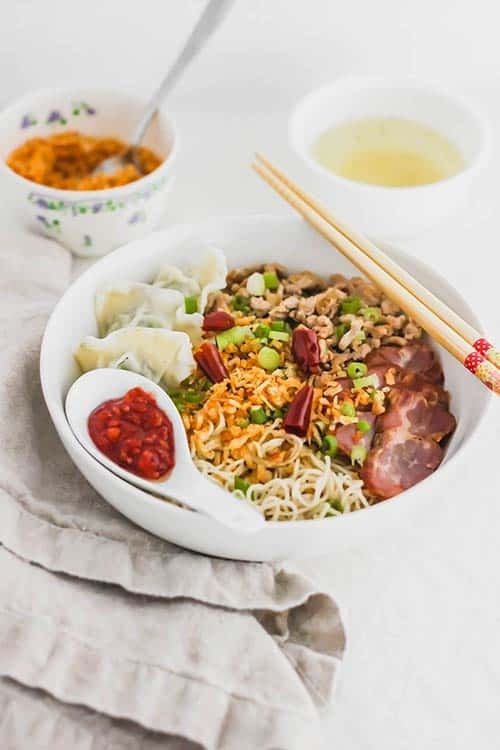 Not to be confused with “wantan mee” or wonton noodles, which are noodles served in a soup broth, kolo mee is served dry with just enough sauce to coat the noodles. 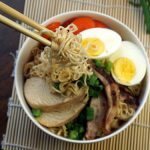 WHAT ARE THE INGREDIENTS IN KOLO MEE? Traditionally, the kolo mee noodles are made with springy egg noodles, topped with sliced BBQ pork (char siu), minced pork fried in lard, fish sauce, MSG, shallots, white pepper, and fried onion. 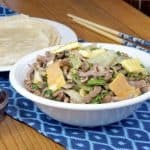 In addition, freshly made wontons, fish balls, and veggies such as choy sum can be added to round out the dish. Sometimes, the noodles are served with a bowl of soup and some soy sauce on the side so that you can adjust the saltiness to your liking. In the interest of healthier and conscious eating, my version will be just as tasty, without the lard and MSG. To give it that extra boost of flavour, I’ll use a touch chicken bouillon powder to enhance that savoury factor. 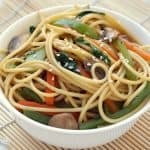 For the simplicity of this recipe, you can purchase fresh egg noodles from an Asian supermarket, but you could always make your own egg noodles for this dish. 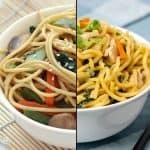 Be sure to choose thin egg noodles and not wonton noodles, which aren’t as springy in texture. 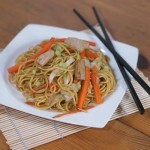 If you can’t find thin egg noodles, “lai mein” or “hand-pulled” noodles are a good substitute. For the ground pork, I like to choose lean ground pork so that the dish isn’t too heavy in terms of fat content. 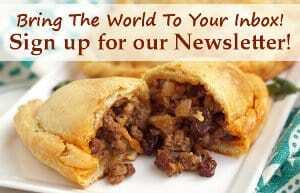 If you prefer a more richer flavour, you can definitely choose regular ground pork. Fish sauce, light soy sauce and ground white pepper can all be easily purchased at an Asian grocery market. For the soy sauce, there is a difference between light soy sauce versus dark soy sauce. “Light soy sauce” is thinner and tastes a little more salty than “dark soy sauce” which is much more rich and less salty. 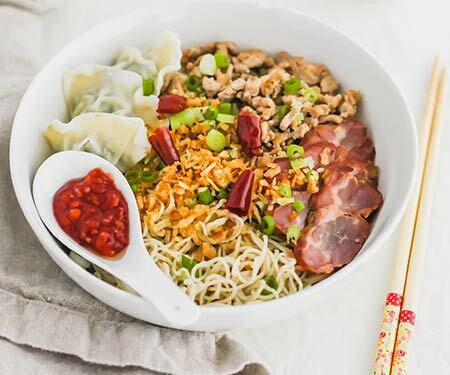 Savoury, springy noodles with a bit of chew to them, paired with the sweet crunch of fried onions — kolo mee is one of those dishes that keeps you coming back bite after bite. And that’s a good thing because kolo mee is eaten anytime of the day in Malaysia: breakfast, lunch, or dinner. Once you try kolo mee, you’ll understand why this is one of Malaysia’s all-time favourite foods. Kolo Mee is a Sarawak, Malaysian dish of dry noodles tossed in a savoury pork and shallot mixture, topped off with fragrant fried onions. A classic staple food in Malaysia, it is eaten for breakfast, lunch, or dinner. Heat a large wok over medium high heat. Add 1 Tbsp of vegetable oil and add in the onion flakes. Lightly fry for about a minute by continuously stirring the onion flakes until golden brown (but not burnt). Turn off the heat, and transfer the flakes into a small bowl. Set aside. Using the same wok, turn the heat to medium high and add in 1/2 Tbsp oil, shallots and garlic. Fry until lightly fragrant, about 1-2 minutes. Crank the heat up to high and add in the ground pork, breaking it up into small pieces. Cook for about 5-6 minutes, stirring occasionally, until no longer pink. Add in chicken bouillon powder, fish sauce, soy sauce, and white pepper. Mix to incorporate everything together. Turn off the heat and transfer the meat to a bowl. Heat a large pot of water and let it come to a boil. Add in the egg noodles and cook according to package directions, about 2-3 minutes, or until al dente. Pour the noodles into a colander and rinse under cold water. 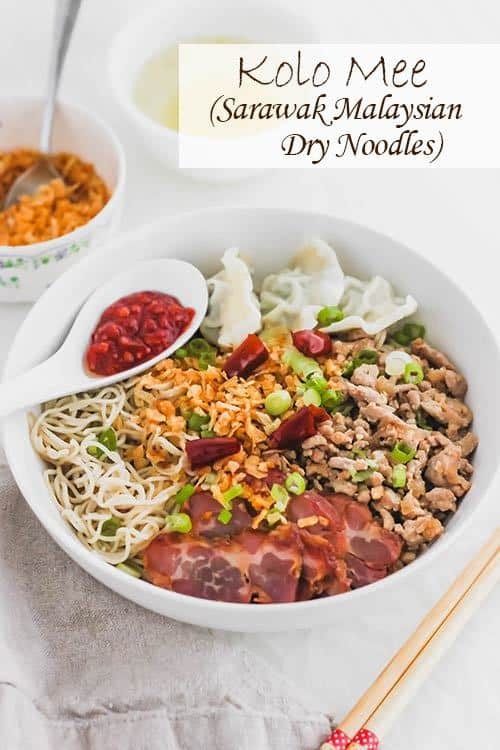 Drain noodles and portion into serving bowls. 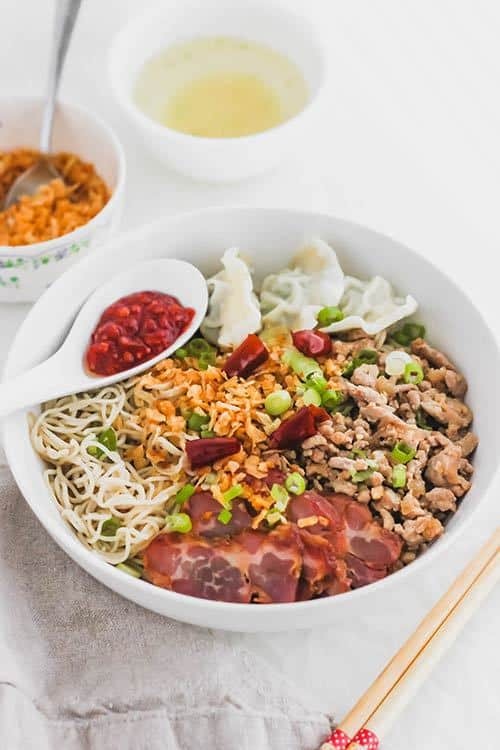 Top the noodles with the 2-3 heaping tablespoons of the warm ground pork mixture, green onions, sliced BBQ pork (char siu), wontons, pickled chilies, and fried onion flakes. 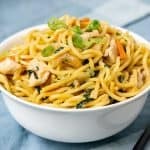 Mix the bowl thoroughly to coat the noodles and serve immediately. I am always fascinated at what different cultures have for breakfast. But with flavours like this, why wouldn’t you? Isn’t that absolutely true? 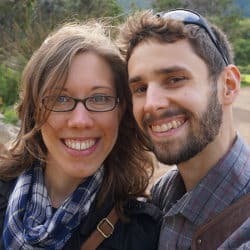 Hope you give it a try!